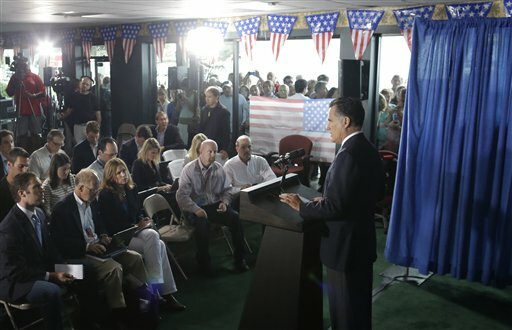 Mitt Romney addresses the press. Echoing concerns I wrote about just two months ago, Mitt Romney made comments this week about the tragedy at U.S. embassies in Libya and Egypt that were downright dangerous. Romney was reckless, enough to try and undermine the president and put American lives at risk all over the Middle East for a pure political play. Tuesday night — the evening of September 11 — both campaigns had pledged to lay off politics in observance of the lives lost 11 years ago. Instead Romney took the opportunity to swagger and rattle sabers, jumping the gun with his slashing critique of the Obama administration. Romney designed his remarks to build foreign policy cred — and to leap off comments made by Israeli Prime Minister Benjamin Netanyahu the day before the embassy assaults. Netanyahu has been pressuring Obama to take a hard line on Iran’s nuclear program and Israel’s right to attack its long-time nemesis. Bibi hopes conservative Jewish voters in Florida can swing the election for Romney, who is already on board with a tougher stand on Iran. But Romney&apos;s words proved two things: first, as I&apos;ve argued before, Romney is totally unprepared be commander-in-chief of U.S. forces; second, he is desperate to change the trajectory of the race, in which President Obama currently has a small lead. The statement released by the Cairo embassy — the one Romney called an “apology” to Muslims — was done without a White House sign-off many hours before the embassy was actually besieged. Many if not most of the GOP’s big names have refused to join Romney’s political attack and have released very different kinds of statements about the incidents. Even his VP choice, Rep. Paul Ryan, stayed away from politicizing these events. Romney doubled down after he was criticized for his remarks, and his inability to mediate his original stance in light of new information is astonishing. Even more astonishing, though, was this: An American ambassador was killed and Romney failed to give condolences to the families who’d just suffered these terrible losses — deaths that occurred in the line of duty. Almost as bad, he failed to understand the very nature of foreign service. "The president takes responsibility not just for the words that come from his mouth but also for the words that come from his ambassadors from his administration, from his embassies, from the State Department," Romney said. Yes, the president must take responsibility for any and all diplomatic acts. But, no, the ambassadors are not the president’s, especially during an election campaign. Most ambassadors are career foreign service, sworn to represent the U.S. under any and all presidents. This was the case with Stevens, who entered service under President George H.W. Bush and served every president after him. U.S. ambassadors are not the president&apos;s, but America&apos;s.
Yet again, Romney doesn&apos;t get it.